A keyboard instrument is a musical instrument played using a keyboard. The most common of these are the piano, organ, and various electronic keyboards, including synthesizers and digital pianos. 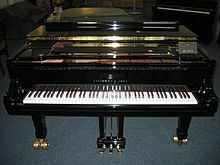 Other keyboard instruments include celestas, which are struck idiophones operated by a keyboard, and carillons, which are usually housed in bell towers or belfries of churches or municipal buildings. Today, the term keyboard often refers to keyboard-style synthesizers. Under the fingers of a sensitive performer, the keyboard may also be used to control dynamics, phrasing, shading, articulation, and other elements of expression—depending on the design and inherent capabilities of the instrument. Another important use of the word keyboard is in historical musicology, where it means an instrument whose identity cannot be firmly established. Particularly in the 18th century, the harpsichord, the clavichord, and the early piano were in competition, and the same piece might be played on more than one. Hence in a phrase like "Mozart excelled as a keyboard player" the word keyboard is usefully noncommittal.